Despite decades of industrial use, the exact chemical transformations occurring within zeolites, a common material used in the conversion of oil to gasoline, remain poorly understood. Now scientists have found a way to locate-with atomic precision-spots within the material where chemical reactions take place, and how these spots shut down. Called active sites, the spots help rip apart and rearrange molecules as they pass through nanometer-sized channels, like an assembly line in a factory. A process called steaming causes these active sites to cluster, effectively shutting down the factory. This knowledge could help devise how to keep the factory running longer, so to speak, and improve catalysts that help produce fuel, biofuel and other chemicals. The team included scientists from the Department of Energy's Pacific Northwest National Laboratory, petroleum refining technology company UOP LLC and Utrecht University. To make this discovery, they reconstructed the first 3-D atomic map of an industrially relevant zeolite material to track down its key element, aluminum. 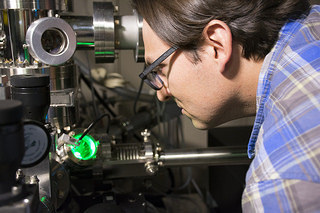 Pacific Northwest National Laboratory materials scientist Danny Perea looks into an atom probe, which he and an international team of scientists used to locate aluminum clusters responsible for the shutdown of catalytic activity in zeolites, a material used by industry to produce fuel and other chemicals. Courtesy of PNNL. Zeolites are minerals made up of aluminum, silicon and oxygen atoms arranged in a three-dimensional crystalline structure. Though they look like white powder to the naked eye, zeolites have a sponge-like network of molecule-size pores. Aluminum atoms along these pores act like workers on an assembly line-they create active sites that give zeolites their catalytic properties. Industry uses about a dozen synthetic zeolites as catalysts to process petroleum and chemicals. One major conversion process, called fluid catalytic cracking, depends on zeolites to produce the majority of the world's gasoline. To awaken active sites within zeolites, industry pretreats the material with heat and water, a process called steaming. But too much steaming somehow switches the sites off. Changing the conditions of steaming could extend the catalyst's life, thus producing fuel more efficiently. Scientists have long suspected that steaming causes aluminum to move around within the material, thus changing its properties. But until now aluminum has evaded detailed analysis. Most studies of zeolite structure rely on electron microscopy, which can't easily distinguish aluminum from silicon because of their similar masses. Worse, the instrument's intense electron beam tends to damage the material, changing its inherent structure before it's seen. Instead, the team of scientists turned to a characterization technique that had never before been successfully applied to zeolites. Called atom probe tomography, it works by zapping a sample with a pulsing laser, providing just enough energy to knock off one atom at a time. Time-of-flight mass spectrometers analyze each atom-at a rate of about 1,000 atoms per second. Unlike an electron microscope, this technique can distinguish aluminum from silicon. Though atom probe tomography has been around for 50 years, it was originally designed to look at conductive materials, such as metals. Less conductive zeolites presented a problem. PNNL materials scientist Danny Perea and his colleagues overcame this hurdle by adapting a Local Electrode Atom Probe at EMSL, the Environmental Molecular Sciences Laboratory, a DOE Office of Science User Facility accessible to scientists around the world. Most attempts to image the material ended prematurely, when electromagnetic forces within the instrument vaporized the entire sample. The key to success was to find the right conditions to prepare a sample and then to coat it with a layer of metal to help provide conductivity and strength to withstand analysis. After hours of blasting tens-of-millions of atoms, the scientists could reconstruct an atomic map of a sample about a thousand times smaller than the width of a human hair. These maps hold clues as to why the catalyst fails. The images confirmed what scientists have long suspected: Steaming causes aluminum atoms to cluster. Like workers crowded around one spot on the assembly line, this clustering effectively shuts down the catalytic factory. The scientists even pinpointed the place where aluminum likes to cluster. Zeolite crystals often grow in overlapping sub-units, forming something like a 3-D Venn diagram. Scientists call the edge between two sub-units a grain boundary, and that's where the aluminum clustered. The scientists suspect that open space along grain boundaries attracted the aluminum. With the guidance of these atomic maps, industry could one day modify how it steams zeolites to produce a more efficient, longer lasting catalyst. The research team will next examine other industrially important zeolites at different stages of steaming to provide a more detailed map of this transformation.